Hundreds of small miners in Nicaragua protested against Canada's B2Gold Corp (TSX:BTO) expansion plans in the central region of the country. 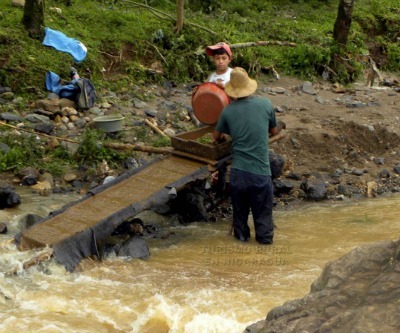 According to reports by La Nacion Dominicana and TelesurTV the artisanal miners blocked access to El Cafetal city on Sunday and demanded that the company stop plans to develop a new zone near its La Libertad and Santo Domingo operations. A spokesman for the small miners association of Santo Domingo said the police fired tear gas and rubber bullets against what was a peaceful "sit-in". Police officers eventually restored access to the town and arrested over 40 protesters. The small miners started their protest six months ago and want millions of dollars in compensation from Vancouver-based B2Gold to account for the potential loss of their livelihoods when B2Gold mines the new so-called sector-4 high-grade gold zone. B2Gold – worth $2.3 billion on the Toronto stock exchange – owns two operating mines in Nicaragua and one in the Philippines and has been ramping up production. Expected output for 2013 is roughly 385,000 ounces increasing to 555,000 ounces by 2015, the first full year of production for the company's Otjikoto project in Namibia. B2Gold also has a joint venture with AngloGold Ashanti in Colombia, which should add a further 200,000 ounces of annual gold by 2017. Image by the Rural Tourism blog of Santo Domingo Nicaragua.